This may be the biggest snow we will see this year even though it didn't quite cover the grass. At least it was pretty until it all turned to rain and made lots of slush. The schools here were out for the day, so Jonathan and I didn't have Bible study. 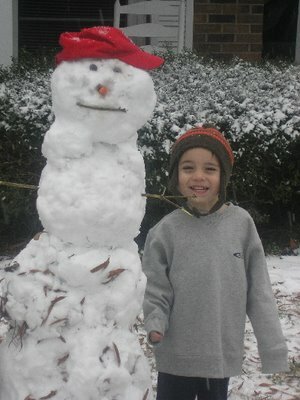 Instead he and Justin made a snow man named Whitey. 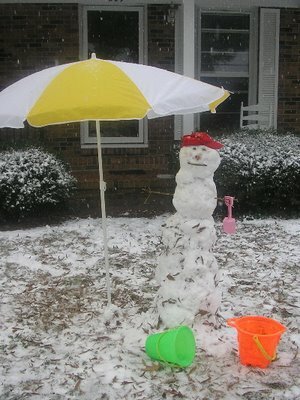 Only this snow man had lots of leaves and grass mixed in. 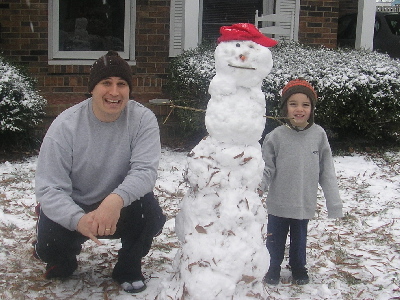 And Jonathan let the snowman borrow his State hat for a while. We suggested lots of normal names, but somehow Jonathan didn't think any of them fit as well as Whitey. Sometimes he's so literal. Anyway, we had fun with friends from church over for lunch and the afternoon. The guys played football on the PS2 while Jonathan bossed everyone else around and made us pretend to eat fake food. I am glad we don't have anywhere to be tonight because it could get pretty icky out there if everything freezes. Tommorrow is supposed to be quite a bit warmer, so hopefully things will get back to normal. It's fun while it lasts, but I'm glad we don't have to deal with snow on a regular basis. The more this kid does and says... The more I love him! He truly is a unique, creative, and exciting individual. I love hearing all of his exciting adventures and new ideas he truly is the coolest kid I know... I guess it's a good thing he's like his aunt! Love you guys!